James Copson enrolled in the Work Ready Program at STEP, Inc. on February 24 2014. At the time, Mr. Copson’s family, including his fiancé and their four children, ages thirteen, ten, eight, and six, was facing eviction for past-due rent and was at risk of becoming homeless. They were also behind in their utility bills. The gas, which was their energy source for heat, hot water, and cooking, had been shut off, and they had received a termination notice from PPL. Mr. Copson reported that they were not able to meet monthly bills and felt “completely lost.” Their monthly TANF income amounted to $670, which in a family of six does not go far, even with SNAP assistance. Mr. Copson was active in a recovery program and struggled daily to remain clean and sober. He had no idea what his career goal could be—he merely wanted to work. Mr. Copson said that he “felt like a loser” and the path that he was on took him “nowhere.” Mr. Copson lacked self-confidence and a sense of worth. Following an initial assessment, his Workforce Specialist (WS), Ms. Lynn Landon, recognized his abilities and discussed a training opportunity, ShaleNET, for jobs in the natural gas industry. Mr. Copson hesitantly expressed an interest and agreed for the WS to assist him in filing an online application to attend classes at the Workforce Development & Continuing Education department on the main campus of Pennsylvania College of Technology in Williamsport. Mr. Copson was a bit nervous and not at all self-assured. He lacked necessary computer skills and, fearing that he might fail, was wary of a classroom setting. With a lot of encouragement from his WS, Mr. Copson passed all of the required tests and made it through the enrollment process. Special Allowances for Supportive Services, available to Mr. Copson through the Department of Public Welfare, provided applicable fees and appropriate attire, and he began training on March 26, 2014. Mr. Copson parted with his long ponytail, which he had lovingly sported, and shaved his face clean in determination to “do whatever it takes” to improve his family’s situation. He stated that he “liked having a taste of what it’s like to work outdoors” and was excited that computer training and résumé writing were integrated into the curriculum. On May 12, 2014, just one month and one day from graduation Mr. Copson was offered and accepted full-time employment with Trican Well Service. Mr. Copson now has a checking account, has learned how to budget his new income, and is proud to say that he is almost out of debt. Mr. Copson no longer needs to rely on public assistance for cash, food, or medical insurance. 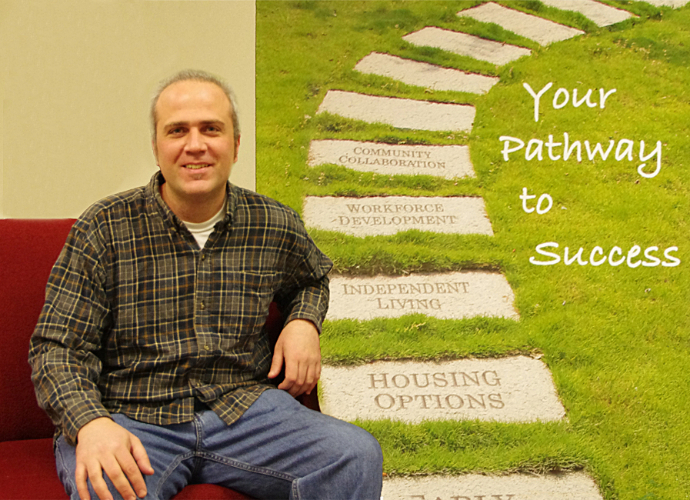 Mr. Copson told his WS that he had made a lot of bad choices in his life, but since he came into the Work Ready Program he knew that he was finally on the path to success!